When you start off the new year, why don’t add some money in your pocket and a bit for your future self? Don’t worry – I’m not asking you to make drastic changes overnight to your finances. Instead I want to show you how to focus on making automated and sustainable adjustments so when you save, the habit doesn’t just stick, you actually grow your money.. When you have a moment this week, go ahead and call your Human Resources Department and increase your 401 (k) contributions by 1% (more is better of course). It’s small enough that you probably won’t notice on your paycheck, but over time, it can bump up your retirement nest egg. You can use the historical averages given for salary increases and annual returns or adjust it to your estimations. 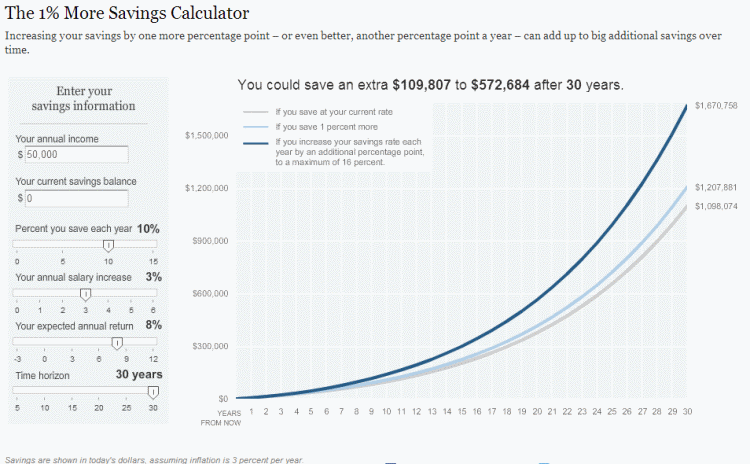 I ran the numbers for someone who has no current savings, 3% salary increases, with 30 years to go before retiring. With the data I gave, my projected earnings could be increased by over $100,000 if 1% more was saved. Are you looking at paying down a debt this year or do you want to establish or build some savings as a financial cushion. There may be a way you can give yourself a small raise in 2013. If you received a big tax refund last year and you expect your finances to remain for next year, you can call Human Resources (again) and adjust your W-4. That will allow you to change your withholdings – you may get smaller refund, but you have more money in your paychecks through out 2013. If you want to make sure that the extra money actually goes to your goals, then setting up a transfer from your checking account to savings or setting up automated payments for a debt is an effective system. You don’t have to constantly check your accounts and you’re most likely to keep it. We created a saving system and it has really helped us over the years. Checking our balances takes about 5 minutes a month and our rates have been consistently higher than most of the brick and mortar options around us. If you have a high yield savings account, such as Ally Bank (open an account today) or Capital One 360 (open an account now), you can also speed up the process of building your savings. We use Ally for some of our savings needs and they have given us great service. they have no minimum balance and are offering competitive rates. What’s great is that you don’t have to switch banks – Ally with work with your current banking system. I’d love to hear from you. How are you financially preparing for next year? What are some of your financial goals Are you looking at paying down a debt? Are you trying to build some savings? What are going to do THIS week to set that up?